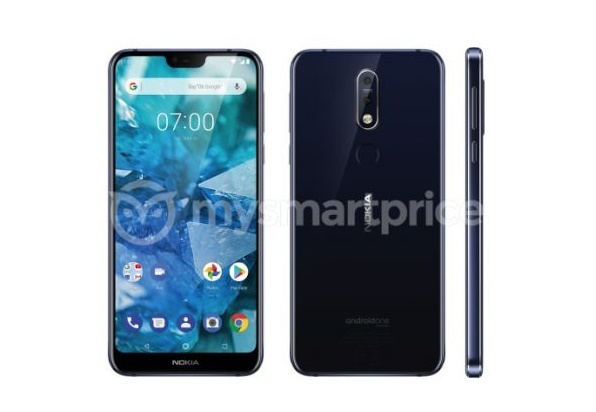 TECHNOLOGY-PORTFOLIO.NET - Previously, there were two leaks that showed smartphone screen panel photos allegedly belonging to Nokia 7.1 Plus or Nokia X7. Both of the screen panel photos do not show the notch or bangs at the top. Now a new rendering has emerged which is claimed as Nokia 7.1 Plus (X7) which shows bangs at the top. The size of the bangs on the rendering does not look as wide as on the iPhone X but also not as small as on Sharp Aquos R2. With the emergence of these two different leaks, it is certainly difficult to believe what is right. While the recent rendering is claimed to be official rendering and there are two other X-series phones that don't have bangs. Regardless of what's right, but if we look at the rendering, the screen on the image has a 19: 9 aspect ratio (not counting for rounded corners). As for the estimated screen resolution is FHD + 1080 x 2280 pixels. Because of the unknown size, we can speculate that the smartphone screen size is around 5.9 inches. On the back side there is a dual-camera setup that uses Zeiss optics. While Nokia 7 Plus has a Zeiss camera, for two other smartphones including 6.1 Plus (X6) and 5.1 Plus (X5) do not have optics from Zeiss. In addition, there is also a fingerprint sensor under the camera. There is also the Android One logo on the back of the phone, where Nokia 7.1 Plus is expected to be launched with Android 9.0 Pie. This smartphone is expected to come with the Snapdragon 710 chipset paired with 6GB RAM. Unfortunately, for now there is no information when the smartphone will be launched.